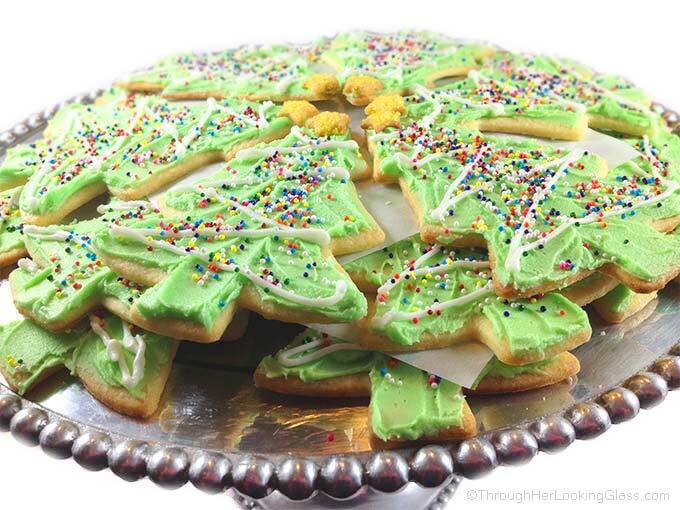 Gorgeous frosted Christmas Sugar Cookies all season long without stress? Yaaaasss! With a little planning and these handy tips, you can too! Say goodbye to thick, heavy roll-out cookies. These taste every bit as good as they look. 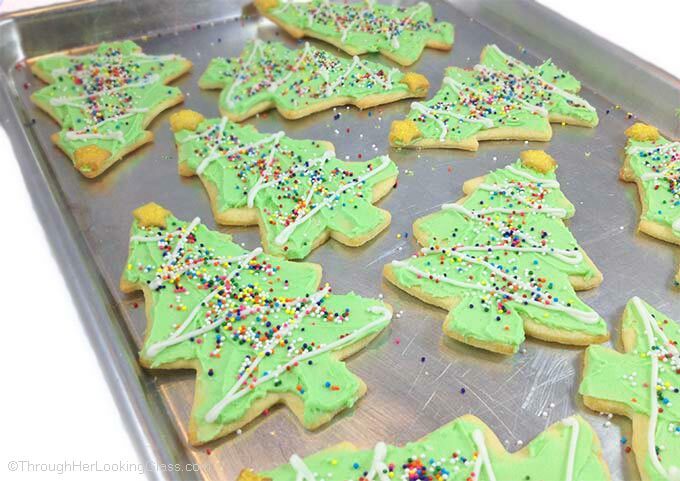 Change up the cookie cutter and they work for any holiday. Individually wrapped, these cookies make a beautiful party favor. Chill in refrigerator for an hour, tightly wrapped in plastic wrap. 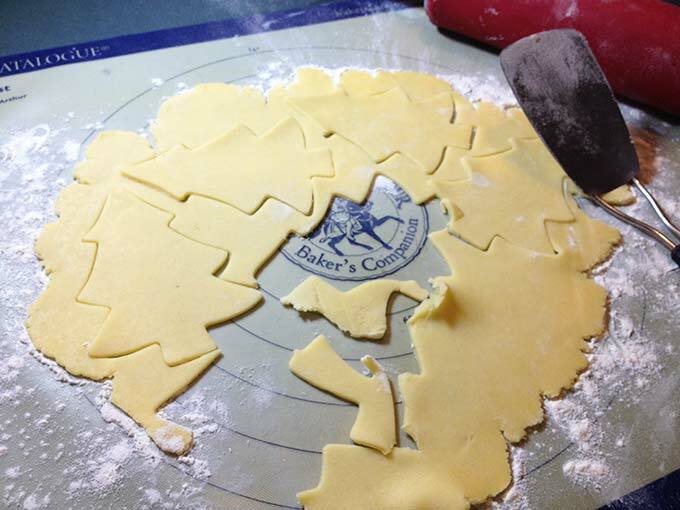 Roll out and cut with just one cookie cutter. (I chose Christmas trees because they fit nicely on a round platter and need only two frosting colors.) Use plenty of flour on your rolling mat so they won’t stick. 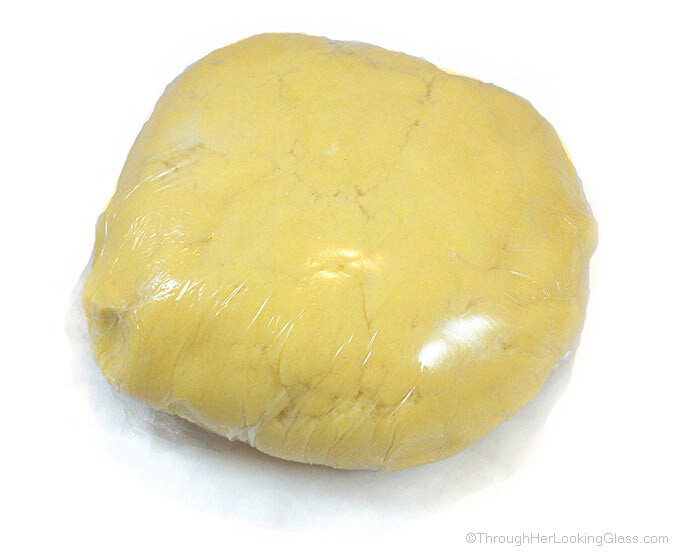 Once rolled, dough should be thin, but not translucent. (If too thick, they’ll puff and lose shape. If too thin, they over brown.) To give you an idea, the cookies in above picture should be rolled just a tad thinner. Watch closely at the six minute mark, they can over brown in seconds. Bake until edges are just browning. Make frosting. Divide and color frosting to coordinate with your cookies. (Less is more in the food coloring department.) Store in the refrigerator ’til use. For best results, use at room temperature with a decorating bag and tip. Pull cookies from the freezer individually and frost for cookie platters as needed all season. They’re more fragile when frozen, but thaw in just minutes. 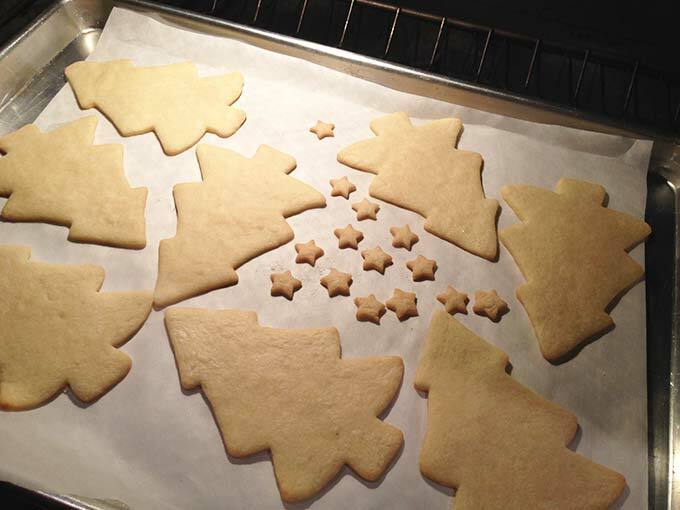 Transfer cookies to serving platter. Once frosting sets, add more cookie layers, with parchment paper in between. The perfect Christmas Roll Out Cookies. Light, crisp and buttery. Only seven ingredients. Taste these and you'll never make a different recipe. They will disappear fast! Add sugar to creamed butter. Stir dry ingredients into creamed ones. Chill dough, tightly wrapped in plastic wrap, for 1 hour. 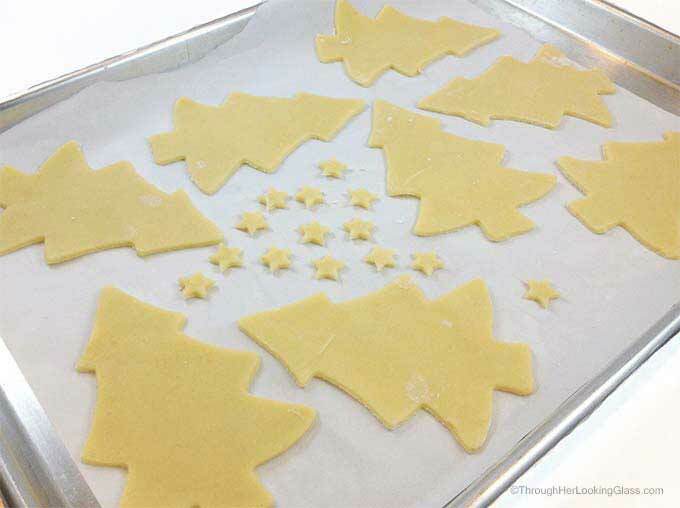 Transfer cut out cookies to parchment lined baking sheet. Refrigerate pan of cookies 5-10 minutes before baking. Bake for 6-8 minutes at 350 degrees, until just browning on the edges. Watch closely at the six minute mark. Add in powdered sugar, 1 cup at a time. 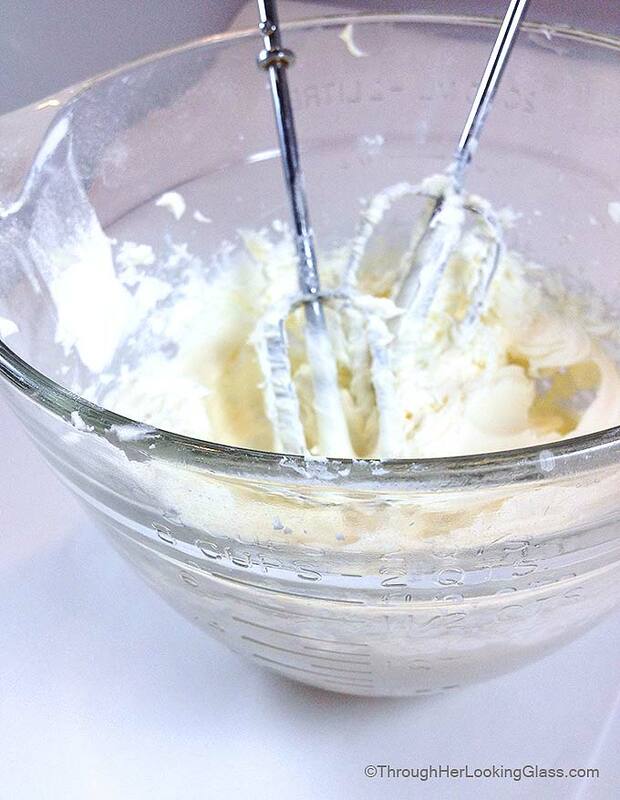 Mix in vanilla and cream, 'til it's the consistency you want. Use a decorating bag and frosting tip for fine details. 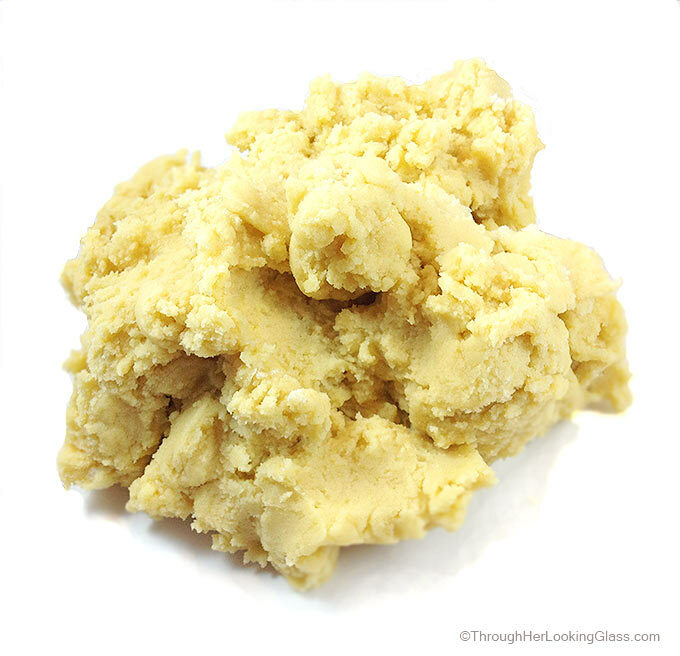 I usually triple or quadruple this cookie dough recipe. 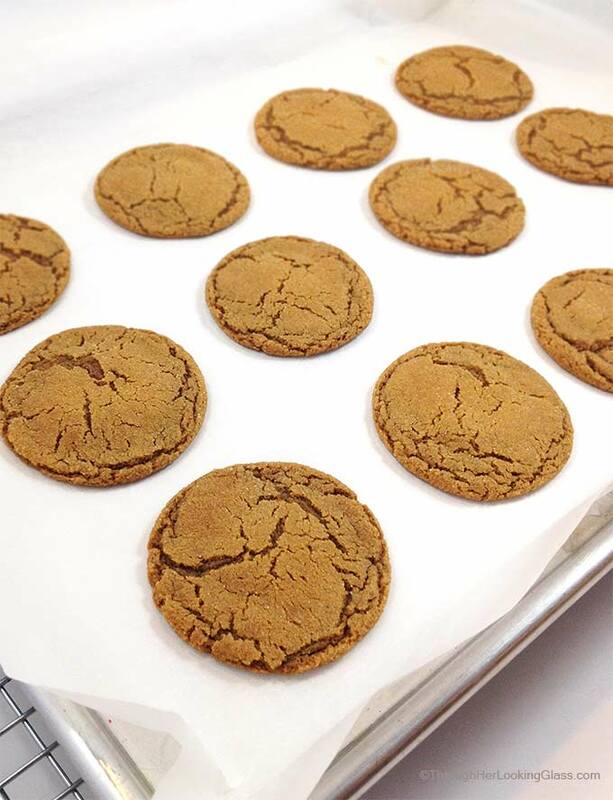 Refrigerate cookies on baking pan 5-10 minutes before baking. These are the BEST and your tips are so helpful! Thanks! They're also beautiful to behold before you bite! I remember making these as a young teen at your house one year around Christmas. Delicious they were! Yummmmmmm, I'll be making some this year! Where was your mother, Jacob??? These are so pretty and sound divine! One question--HOW MUCH powdered sugar do you use for the Buttercream icing?? Love this recipe, Allie. It is going into the folder with all of your other blog materials. They look great - is parchment paper essential? I'll have to get some! I have coffee - but I don't have these cookies and now I want these cookies because that coffee just isn't gonna get drunk otherwise! :) These are adorable Allie - and the perfect base for that fluffy frosting! P.S. GAH - my coffee now tastes bitter after looking at these cookies...so not fair! I have the recipe!! Yay! Love these cookies. Thanks for sharing. The pictures make me want a cookie now! 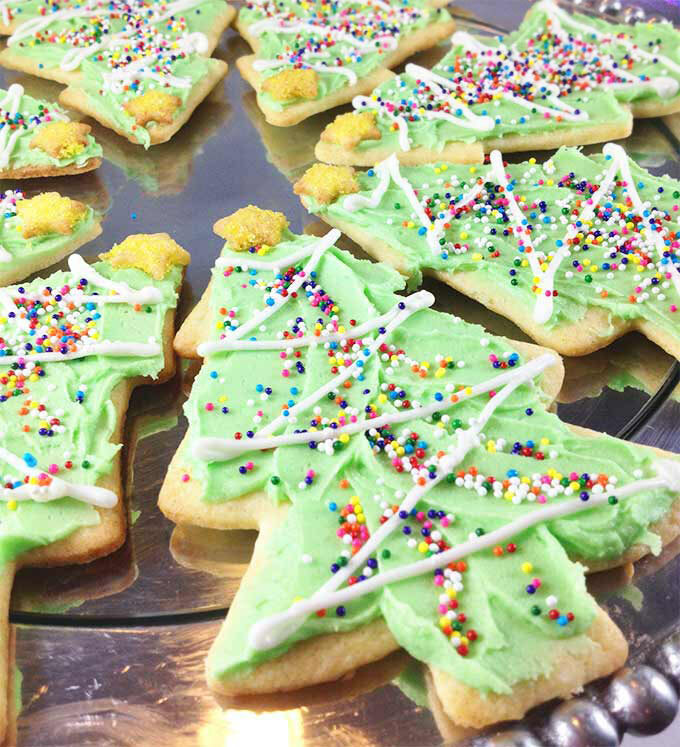 These look delicious - perfect for the holidays! Great baking tips - I need to remember to chill the dough before baking. These are so cute, I'm sure Santa is going to love these! I remember having these last year with your family! They are so good! I would recommend them to everyone! And they are super cute too? These are the best cookies eva! They are so good that after you make them you should do a mic drop! Wow, Thanks for the great post, Allie! 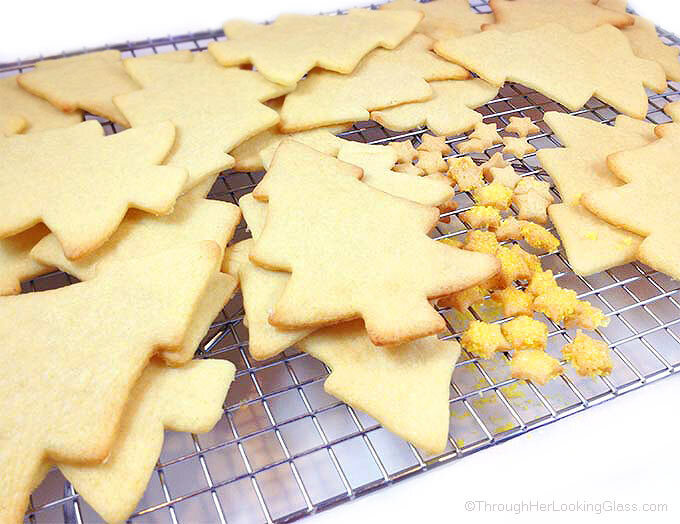 I'm a huge sugar cookie fan, and normally use a thich shortbread dough for my cookies. Your tips and photos are VERY helpful! I look forward to trying your recipe. LOVE the glittering gold stars to top the Christmas trees!! Merry Christmas! I adore sugar cookies like anything. And these Christmas cookies roll out look so festive and pretty, Allie. Your baking tips are wonderful. Cheers my friend. I make similar cookies every year together with the kids and we always decorate them with sugar colorful streusel. They love to make and eat them and I am sure they would love this version as well. Such pretty trees and I love the sound of that icing. I wish a very Merry Christmas and all the best for you and your boys.